Visiting the coasts of Aysén provides you with a great opportunity to learn about the large number of seabirds that habitat the fjords. Here?s a brief guide to help you identify them. Start: Anywhere along the coast and channels of Aysén. End: Captured in great photographs or sketches for your journal. Special Considerations: If you are passionate about birds we recommend the English field guide, A Wildlife Guide to Chile, by Sharon Chester or the Spanish field guide, Guía de campo de las especies de aves y mamíferos marinos del sur de Chile, by authors Rodrigo Hucke Gaete and Jorge Ruiz Troemel. To listen to bird calls and songs, visit: www.xeno-canto.org. Reservations: Although there are currently no specialists offering bird watching, there are several guides and captains who provide tours along the coast. Approximately 470 species of birds have been recorded in Chile and 109 of those are considered seabirds, meaning that they obtain their food from an area near the coast. Seabirds of the fjords and channels of Aysén include albatrosses, petrels, fardelas, terns, cormorants, seagulls and pelicans. You’ll have the opportunity to observe these species from various points along the coast or you can contract an excursion with local fishermen or captains that are equipped to offer tours. So, keep a close watch when you are sailing the channels and exploring coastal towns and forests, like those you’ll encounter in Raúl Marín Balmaceda, Puyuhuapi and Puerto Cisnes. Bird watching is a great form of recreation that blends hiking, listening, visual observation and science. Success depends on a variety of factors, including your level of experience as an observer, the characteristics of the environment where you are, and of course, the cooperation of the feathered friends you encounter. In the coastal areas of Aysén, the environment is ideal for bird watching and the feathered friends are plentiful so, here are a few tips to help you with your skills. First, when birds are distant, note their form and structure; then, begin to observe their coloration and plumage. Other aspects that will help you with the challenge of identification include the bird’s silhouette, its size, and the shape of its wings, beak, tail and feet. The pattern of plumage coloration is the most commonly used feature for identification, because it not only allows you to differentiate between similar species, it also helps you distinguish sexes and determine the level of maturity of the bird. Generally, birds tend to have two basic plumages; one associated with being a juvenile, and another with being adult. But before you decide you can master all this in a single outing, consider that there many species, like the albatross, for example, which don four to seven different states of plumage during its lifespan. Bird watching is both fun and a tremendous challenge! Wilson’s Storm Petrel or Golondrina de mar (Oceanites oceanicus). This small seabird is abundant in the fjords of Aysén and throughout the coastal areas of the southern hemisphere. It likes the open sea, frequenting channels and estuaries. Wilson’s Storm Petrel nests in caves throughout the Antarctic and sub-Antarctic islands, as well as the southern part of Chile. When they search for food along the surface of the ocean, they lower their long legs to skim the top of the water, giving the impression that are walking on its surface. Length: 17 cm. Wingspan: 40cm. Coloring: Coffee and black with noticeable white band across the tail bone continuing toward the sides. Gray line across the dorsal surface of the wings. Magellanic Diving Petrel or Yunco de Magallanes (Pelecanoides magellani). This small diving petrel is endemic to the Patagonian waters, distributed between the Chacao channel (Chiloé) and Cape Horn. It prefers coastal areas, so it is common to observe small groups diving and feeding in the fjords and channels. As is characteristic of petrels, they nest in caves amongst the islands, living and breeding in colonies. Their reproductive period begins between November and December. Length: 22 cm. Wingspan: 32cm. Coloring: The Magellanic Diving Petrel can be distinguished from other petrels by a crescent shaped band at the base of its head where it joins with the white of the body. The blackish dorsal feathers are lined with white, particularly noticeable in new plumage. Red-legged Cormorant or Lile (Phalacrocorx gaimardi). The Red-legged Cormorant is one of the most beautiful species of cormorants, with a habitat that is distributed along the Pacific coast, from Peru to the Aysén Region in Chile, and there are also some colonies in Argentina. It is a threatened coastal species showing rapid declines; affected by fishing operations and industrial development. Around 70% of the world’s remaining population is distributed between the Regions of Aysén and the Lakes Region, further north. They nest in permanent, year-round colonies along cliffs or rocky coastal walls where they lay two to three eggs per year. Both males and females share the parenting tasks of nest protection, incubation, care and upbringing. Coloring: Gray with a conspicuous white spot on each side of the neck. Yellowish-orange beak with reddish face. Green eyes. Red legs and feet. Juveniles experience several morphs but generally appear brownish above, paler below with a dark throat patch and orange or dark-colored legs. Magellanic Cormorant or Rock Shag (Phalacrocorax magellanicus). This relatively small member of the cormorant family habitats the coastal areas of Chile from the Lakes Region to the Diego Ramirez Islands as well as the Atlantic coasts of Argentina as north as the Chubut Province. It is a rather shy bird that lives in small groups, amongst coastal cliffs, often mixing its colonies with other species of cormorants. Coloring: Black upper body and neck. Underparts white. Thin blackish bill. Red orbital ring and bare areas of the face. Pink legs. Juveniles are almost completely dark, with some bright spots on their chest and abdomen, and are often confused with the Guanay Cormorant, especially when they are in the water. However, their silhouette, including the shape and size of the head and beak, will help you with identification. This very large marine bird with a wingspan of up to 228 cm, resides in large colonies along the coasts of Chile and Peru. They often fly close to the surface of the water in long lines or in V-formation. To feed, they dive into the water, catching fish within the large bag at the bottom of their beak. Length: 125 cm. Wingspan: 228 cm. Color: White head with yellowish shading, yellowish beak. Dark body, with white spots. Gray legs. Grey Gull or Gaviota Garuma (Larus modestus). This bird is native of Chile, with a color pattern and plumage that changes each year until the bird reaches the age of three, becoming an adult. It is the only grey gull found in Chile. It feeds on sea fleas and crustaceans along the beaches. Coloring: When adults are in their mating season a white plumage protrudes from their heads; the rest of the year their heads are grey, as well as their tails. They have black legs and a black beak. Snowy Egret or Garza chica (Egretta thula). This beautiful coastal bird frequents sandy beaches, freshwater marshes and at times, rocky coastlines. Their population has been heavily impacted by maritime accidents, oil spills and the use of pesticides. Coloring: Totally white. Black bill, with yellow base. Long legs that are black in front and yellow behind. Dominican gull or Kelp gull (Larus dominicanus). The most common of Chile’s gulls, this handsome inter-tidal bird derives its scientific name from the black and white plumage typical amongst adults, which is similar to the habits of the Dominican nuns. As omnivores, these birds feed on plankton, invertebrates and fish and have even been known to peck holes in the backs of living whales and feed on their flesh. They nest along beaches in shallow depressions lined with grasses and feathers, where the female lays 2 or 3 eggs per year. Coloring: White head, tail, chest and abdomen, with black wings and back. Yellow beak. The colors of the plumage in juveniles completely changes each year until they reach adulthood at the age of four. 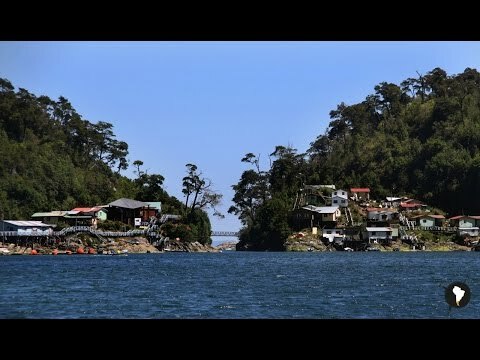 Explore Melinka, one of the small beach towns of the Guaitecas Archipelago, where you?ll discover great seaward overlooks and a myriad of stories and legends, including tales of the raids of pirate, Pedro Ñancúpel. Will you be the lucky one to discover his treasure? The Andean condor is the national symbol of Bolivia, Chile, Colombia, Ecuador and Peru, and represents power, strength and freedom for the people of Patagonia. In Aysén it's still a daily event to stop, look up at the sky and marvel at these giants circling in the jet-stream high above without any visible effort. Seeing them up close is a privilege extended to only a few, but if you're willing to get up early, you're likely to be rewarded in Aysén.